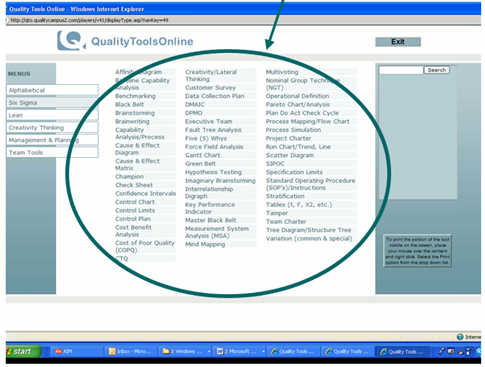 Here are a few of the many features you’ll find inside QualityToolsOnline™. Tools organized by method: At the Main Menu, you will find that you can access tools any way you like…Tools organized by method. Just click on any button to see tools sorted alphabetically, Six Sigma, Lean, Creativity Thinking, Management & Planning or Team Tools. Searchable by tool, phrase or word: You also have the option to “Search” for a tool or concept to see if it’s in the database of information. The search function will appear on every page so at any time you can jump from one tool to another. 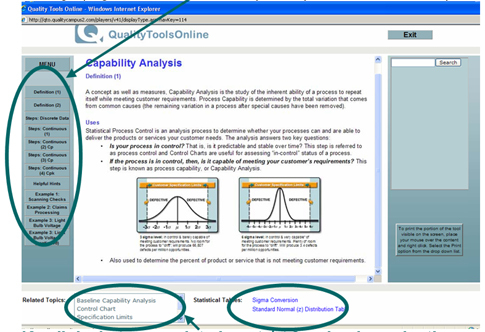 Click, for example, on the “Six Sigma” button and you’ll see all the tools and concepts included to date. And this is the just the beginning. We’ll be regularly adding more tools and concepts content. Tools and Concepts Content: Depending on the content, you’ll find a varying number of navigation buttons that will take you through pages of definitions, steps, helpful hints and examples. Key links between related content for simple navigation: But, it doesn’t stop there. Related Topics will provide you with automatic links to topic areas that are related to the current topic you’re viewing. Additional information in the form of links to statistical tables, recommended resources, or downloadable forms may also be available. Done with the tool or concept? Go directly to another topic using the related topics button, the search function, or, from every tool page, use the MENU button to take you back to the menu of menus! Constantly expanding database with more tools and concepts: We have many more tools and concepts that we’ll be bringing you over time. We’ve got our list. Does it match some of the things you’re looking for? Let us know what you’d like included! Or, do you have an example of an actual tool application that you’d like to share with everyone else? We’d like to expand our example pages…across tools and across industries. If we use it, we’ll list you and your organization’s name. We’ll also put your name into a drawing. 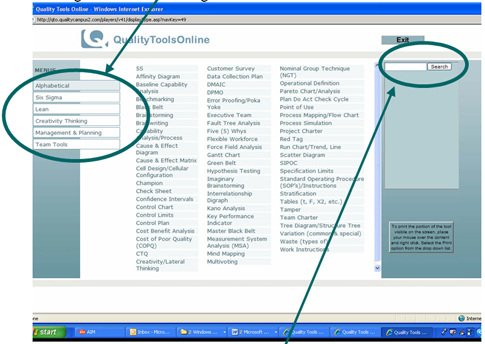 Once-a-quarter one winner will get three free QualityToolsOnline™ one-year subscriptions for anyone of their choosing.